Almost everyone uses email. Like traditional mail, it can pile up if left unchecked. Yahoo! 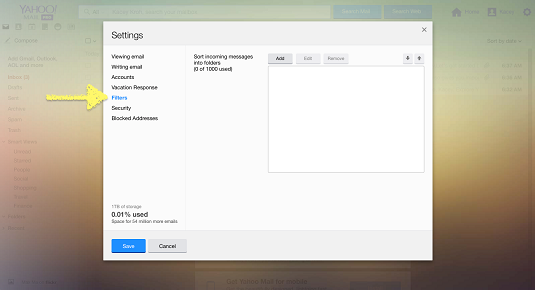 has a nifty feature that helps filter your mail into folders so your email accounts are easier to manage. Knowing how to create a filter in Yahoo! Mail can make your life immensely easier. You can keep organized and create up to one thousand custom filters in Yahoo! Mail that will sort new messages to the folders that you define. This feature even allows you to send unwanted content to your spam folder or directly place items in the trash. While most spam should already be in the spam folder, some may slip through. Applying a filter in your Yahoo! Mail will help you remove those pesky spam emails that make their way in to your regular inbox. Keep in mind, other email clients like Gmail or Outlook also provide similar features. With Yahoo! Mail, you can connect all or most of your other email accounts and keep other inboxes organized with filters as well. Simply go to Settings→ Accounts → + Add another mailbox from the Settings gear in the top right corner of the Yahoo! Mail home screen. From within the Settings popup window, you can also import and export contacts and do other cool stuff. Play around with the settings to see which configuration works best for you. You can login to your Yahoo! account from any web browser and download the app from Google Play Store and Apple’s App Store. Click or tap on the gear located in the top right corner of the Yahoo! 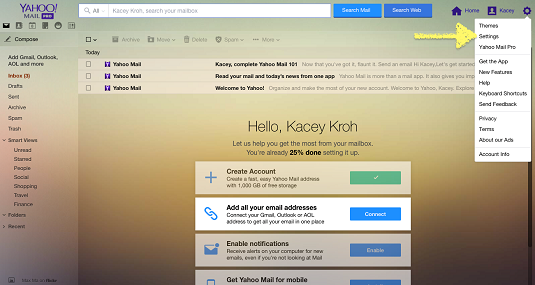 Mail home screen. Click or tap on Filters located within the left-hand sidebar of the Settings popup window. Click or tap on the Add button located top-center of the Settings popup window. Enter a filter name in the textbox located on top of the Add Filter popup window. Enter filter criteria just below the filter name textbox within the Add Filter popup window. Select or create destination folder from the drop-down list located along the bottom of the Add Filter popup window. Click or tap the Save button to finalize your changes. 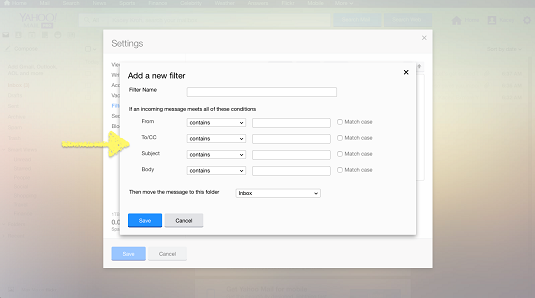 Adding a filter in Yahoo! Mail has never been easier! You can manage your filters from the Filter screen within the Settings popup window. Prioritize your list by dragging items up and down in order of importance. If you need help with other Yahoo! related tasks, you can always visit the Yahoo! help page for further assistance. Keep in mind, filters will only work for new email, any existing email will need to me moved into folders manually. Select Filters from the left-hand sidebar. Choose a filter from the list and click or tap on the Edit button along the top of the popup window. Edit your filter and click or tap the Save button along the bottom of the popup window. You can also delete filters by choosing one from your list and simply clicking or tapping on the Delete button on top of the Filters screen from within the Settings popup window.